The Sony Ericsson Open has once again attracted the world's top tennis players to South Florida as they battle their way through tough opponents and our hot weather to win the #1 spot! 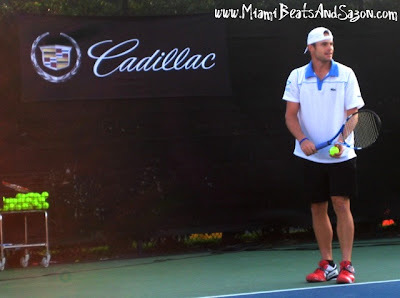 Last week I had the pleasure of checking out these top tennis stars as they gathered at The Ritz-Carlton, Key Biscayne for an evening of fun. On Tuesday, March 22nd, Andy Roddick, Kim Clijsters, Caroline Wozniacki and Ryan Harrison came out to raise money for the Greater Miami Tennis & Education Foundation [GMTEF] at the resort's Cliff Drysdale Tennis Center to co-host the 2nd annual All-Star Charity Tennis Event. It was definitely a unique and intimate event where fans and tennis players had the chance to play against each other for a great cause! About 150 lucky spectators and VIP guests attended this event while enjoying champagne, specialty cocktails and hors d'oeuvres. Here are some great pictures for you to see and don't forget to visit the GMTEF's website to help our city's youth pursue their dreams in the tennis world! Above: The man we all like to call "The King of Serve" a.k.a. Andy Roddick. During this year's All Star Charity Event at The Ritz-Carlton, Andy showed the crowd how hard he could really serve as he played against local opponents. The event featured an exhibition match called the "King & Queen of the Court" challenge where the pros played against the amateur Round Robin winners (two local players who qualified for a spot to play during the event). My personal favorite and most exciting match to watch was the "Battle of the Sexes" because [of course] the ladies won!!! Make sure you congratulate Kim and Caroline if you run into them at the Sony Ericsson this week! It was an incredible experience to watch these women in action! Above: Belgian-native Kim Clijsters enjoying her time at the All Star Charity Tennis Event. During the matches, the audience was able to hear the players taking to each other because they each wore a small mic to add a flare of fun to the event. Trust me...these players are talented and have a great sense of humor! Did I mention Clijsters was the Sony Ericsson's 2010 women's champion? Go Kim! Above: Ryan Harrison returning a shot during the All Star Charity Tennis Event at the Ritz-Carlton in Key Biscayne. 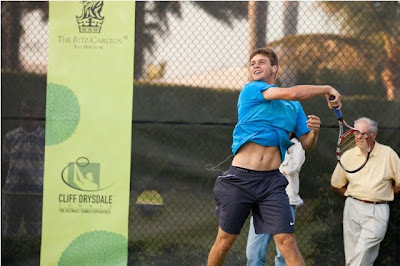 Harrison began his tennis career at the age of two and became the first American teenager to beat a Top 20 opponent in a Grand Slam since Roddick at the 2001 US Open. Above: Caroline Wozniaki [who arrived straight from her Indian Wells win] is a Danish pro tennis player and the number one singles player in the world. 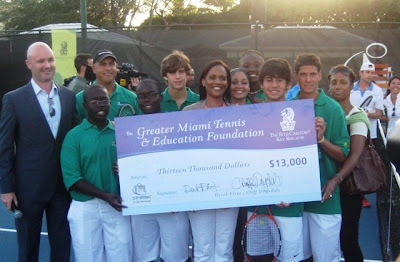 All of the proceeds from this event benefited the Greater Miami Tennis & Education Foundation (GMTEF) who were presented with a check for $13,000. 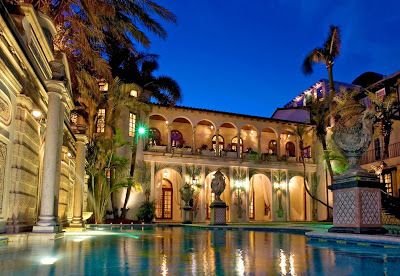 GMTEF's mission is to develop, organize and conduct tennis, education and life skills development programs for youth from socially and economically challenged communities in Miami-Dade County. For more information on GMTEF or to learn about their upcoming events, visit their website. 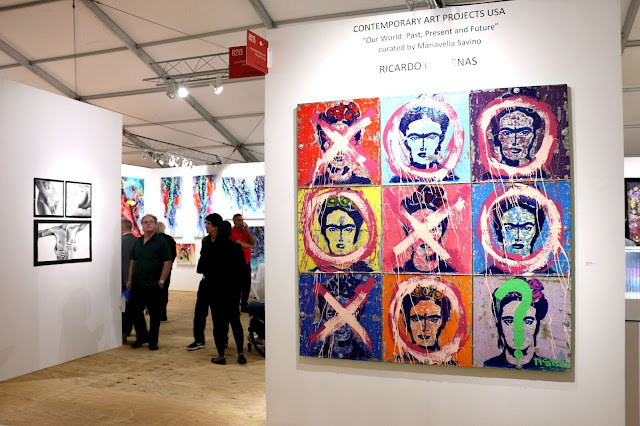 Cheers to a spectacular tennis event at the Ritz-Carlton in Key Biscayne [Miami's only AAA Five Diamond Resort] and remember to always give back to your community! My favorite post yet! Great job!